Fortified wines may be something of a ‘hard sell’ to most consumers outside of the Christmas season, but there is always excitement around the declaration of a Port ‘vintage’. Though very good wines can be produced from every harvest in the Douro, most years are not declared as ‘vintage years’, so no vintage Port is made. The decision on whether to declare a vintage year – when maturing casks of wine are deemed good enough to be aged and bottled under the strict regulations necessary for vintage Port – is down to each individual Port producer. Some years are unanimously declared, the most recent being 2011, but in other years only some of the region’s producers decide their particular young wines make the grade. 2014 was such a year: not universally declared by any means, with only a handful of the Douro’s top names declaring. 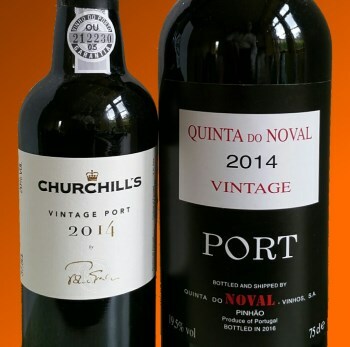 I recently received samples of two of these, from two famous houses, Churchill and Quinta do Noval. Johnny Graham, founder of Churchill commented: “The 2014 vintage promised to be exceptional until mid-way through harvest when torrential rains fell. Luckily we had decided to pick early, before the rains struck, and have been rewarded by a small but spectacular crop.” And indeed it was those rains that spoiled the party for most producers in terms of ultimate vintage quality. (2017) Unusually, this wine is being offered in magnum or half bottle only (note price quoted is for a half bottle). It's mostly Touriga Franca, but as is normal for Port there's a host of other varieties in the blend inlcuding Tinta Roriz, Tinta Barroca and Touriga Nacional. It's a beautifully solid and in its way, 'masculine', style of Port, with rich black fruit, chocolate and a hint of kirsch cherries on the nose. Sweet, smooth, mouth-filling and luscious, the spirit is already elegantly amalgamated with the fruit and creamy tannins, and it retains very good acid freshness. Drinking so nicely, but no doubt capable of considering cellaring - especially those magnums. (2017) What a contrast in styles between this and Churchill's, the other major Port name to declare 2014. It is lighter, not just physically in terms of texture (and a drop or two of alcohol) but with some herbal, even floral notes lined-up against the Churchill's brawny depth. In the mouth beautiful raspberry ripple lift and creaminess sits over a more dense, plum and chocolate depth, some tobacco, fig and spice developing and quite a serious tannic structure. There is not a huge amount to separate these in my mind on absolute quality, but quite a gulf stylistically.